In this video, Dr. Huntoon discusses the 4 Causes of ALL Health Concerns and what doctors often miss when it comes to understanding Hot Flashes. Having this symptom is very unpleasant for a woman. Taking artificial or even "bio-identical" hormones will NOT be a TRUE SOLUTION and you may end up spending lots of money, while increasing the likelihood of developing other health concerns over time. Do you really want to grow old this way? 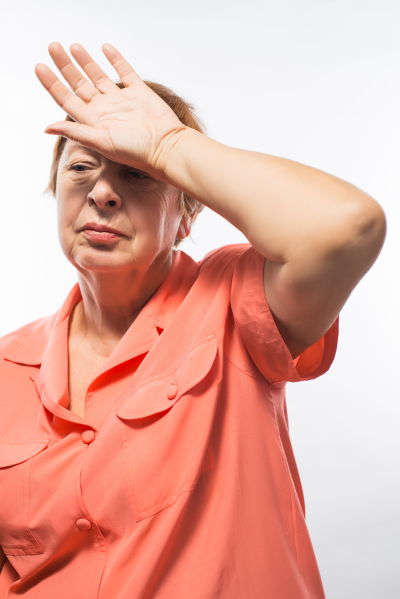 Hot Flashes have many potential causes, however what follows are the basic mechanics. Lack of Kidney/Adrenal System function can lead to inadequate raw materials necessary for the production of hormones, thus leading to hot flashes. Two basic aspects of the Kidney/Adrenal System are "yin" and "yang." Yin is cool, moist and nourishing. On the other hand, yang is hot, invigorating and moving (an example of yang gone "awry" would be one experiencing night sweats). Hormones can have more yin or more yang properties. For example, estrogen (which helps to prepare the body for and maintain pregnancy) may have more yang properties and progesterone (which helps prepare the uterus for receiving and nourishing a fertilized egg) may have more yin properties. Hormone balance (therefore Kidney yin and yang balance) is critical for normal body temperature. When such hormones slip out of balance, many symptoms, including hot flashes, may result. The yin may become deficient, causing the yang to "rise" to the surface of the body causing an intense sensation of heat and possibly perspiration. As you can see with this particular health imbalance, there is an underlying cause. The key to success in treating these problems lies in addressing the underlying issue described above to eliminate the problem over the long term. chemicals in food and municipal tap water (which most often contains chlorine and fluoride, considered by many as dangerous chemicals). It would also be necessary to supplement your diet with the necessary whole food building blocks to address the deficiencies that form the basis of this imbalance. Hot Flashes are very common in society today, but that doesn't mean it is normal nor does it mean it is something you have to suffer through. Medicine does not have a lot to offer you if you experience hot flashes. Most medical doctors will tell you to avoid the triggers, exercise and consider HRT. How Long Will I Have Hot Flashes? Hot flashes vary among women going through menopause. Some women have hot flashes for a very short time during menopause while other women may have hot flashes for life. Generally, hot flashes are less severe as time passes. Can I Prevent Hot Flashes? Stay cool. Keep your bedroom cool at night. Use fans during the day. Wear light layers of clothes with natural fibers such as cotton. Try deep, slow abdominal breathing (six to eight breaths per minute). Practice deep breathing for 15 minutes in the morning, 15 minutes in the evening and at the onset of hot flashes. Exercise daily. Walking, swimming, dancing, and bicycling are all good choices. Try chill pillows. Cooler pillows to lay your head on at night might be helpful. Talk to your doctor about taking hormone replacement therapy, or HRT, for a short time -- less than 5 years. This treatment prevents hot flashes in many women. Plus, it can help other symptoms of menopause, including vaginal dryness and mood disorders. Keep in mind that when you stop taking HRT, the hot flashes may come back. Short-term HRT carries some risks, including blood clots and gallbladder inflammation. If HRT is not right for you, there are other treatments that may offer relief. It is important to clear any new drugs (including over-the-counter) or supplements with your doctor before taking them. Are "bioidentical" or "natural" hormones safer and more effective than hormones used in traditional hormone therapy for menopause symptoms? Answers from Shannon K. Laughlin-Tommaso, M.D. No, they aren't. According to the Food and Drug Administration (FDA) and several medical specialty groups, the hormones marketed as "bioidentical" and "natural" aren't safer than hormones used in traditional hormone therapy, and there's no evidence they're any more effective. The term "bio-identical" means the hormones in the product are chemically identical to those your body produces. In fact, the hormones in bio-identical medications may not be any different from those in traditional hormone therapy. Several hormone therapy products approved by the FDA and prescribed by health care providers contain bio-identical hormones. "Natural" means the hormones in the product come from plant or animal sources; they're not synthesized in a lab. However, many of these products still need to be commercially processed to become bioidentical. Traditional hormone therapies don't necessarily exclude natural hormones. Some FDA-approved products — such as Estrace, Climara and Vivelle-Dot, which contain estrogens, and Prometrium, a natural progesterone — also are derived from plants. They're produced in doses and forms that differ from those in FDA-approved products. For many nonstandard combinations, you need to go through a compounding pharmacy — one that specializes in making medications customized for your individual needs. However, products from compounding pharmacies haven't been subject to the same rigorous quality assurance standards that standard commercially available hormonal preparations have to meet. They're custom-made for you, based on a test of your saliva to assess your unique hormonal needs. Unfortunately, however, the hormone levels in your saliva don't reflect the levels in your blood or correspond to menopause symptoms. Some women may benefit from nonstandard doses and forms of hormones in compounded bio-identical hormone preparations, but there's currently no scientific support for an advantage of these compounds over common commercially produced preparations. There are plenty of doctors that say otherwise, which begs the question. If these bio-identical hormones are processed by pharmaceutical companies for the medical profession, then why the division within the medical community? Dr. Huntoon has quite a history helping women deal with hot flashes naturally. Initially he was asked by his mom to help her with the uncomfortable "hot flashes" she experienced in the board meetings as an Executive in a male dominated industry. She said, "Having hot flashes when presenting to a room full of men is not the best look and I need you to help me find something that will stop this from occurring." We found the appropriate solution for her and she was able to transition through peri-menopause to menopause in a much more agreeable fashion. Working with a Holistic Chiropractor is the best way to get a hold on this problem. If you feel you experience hot flashes because you have a hormonal imbalance, and you would like to look at the underlying cause, we can help you. Dr. Huntoon has years of experience helping women deal with their hormonal imbalances in a safe, effective and most importantly, Natural way! Coming in for an evaluation to determine the balance/imbalance within your Kidney/Adrenal System would be prudent. Helping you to discover the necessary ingredients to your imbalance and supplementing them with the necessary whole food ingredients for you is the best course of action you can take. Taking artificial hormones prescribed by your medical doctor is NOT the best way to deal with this imbalance, even if they call the "Bio-identical" hormones. Artificial hormones have been associated with an increase in the likelihood of cancer in your reproductive organs, and having your organs removed is not the ideal way to address this natural process of menopause. Transitioning from being fertile and of childbearing age to being post menopausal and continuing to lead an active and energetic life is a natural process of aging. Buying into the notion that it is normal to have hormonal imbalances and you need to be on medication for this imbalance is not rational and if you address the underlying imbalance, it is also not necessary.